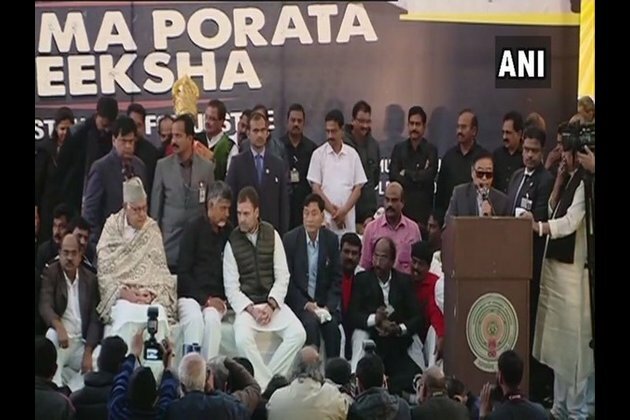 New Delhi (India), Feb 11 (ANI) Andhra Pradesh Chief Minister N Chandrababu Naidu on Monday held a day-long hunger strike in the national capital, accusing the Prime Minister Narendra Modi-led government of failure to grant special status to the state. He was joined by Congress president Rahul Gandhi besides leaders of the TMC, SP, AAP, NCP and National Conference.
" to rule the country.
" the Chief Minister said. He said the TDP came to Delhi to explain to the nation the "injustice" done by the Centre to Andhra Pradesh. "Yesterday, Modi went to Guntur and slammed me but did not announce anything for Andhra Pradesh. The BJP will be washed out in Andhra Pradesh forever. The BJP is dividing the nation. We are here for uniting the nation. We are here to explain to the nation the injustice done by the Centre to Andhra Pradesh. We are also part of this country. Our aspiration must be fulfilled. We will take the help of all parties and achieve our target," the Chief Minister said. "loot" as according to a media report he had removed the anti-corruption clause from the controversial fighter jet contract. "Every Defence deal has an anti-corruption clause. The Hindu has reported that the Prime Minister removed the anti-corruption clause. It is clear that the Prime Minister facilitated the loot," Rahul told media at the event. Backing Naidu, he said: "I stand with the people of Andhra Pradesh. What kind of a Prime Minister is he? He did not fulfil the commitment made to the people of Andhra Pradesh. Modi tells a lie wherever he goes. He has got no credibility left. "After that on Jan 9, 2019, the SP and the BSP came together. On that day, senior leaders of 22 political parties came on the same stage (to show opposition unity)," he said. Meanwhile, the BJP claimed that Naidu was staging the protest without following any protocol for "political purposes". "He (Naidu) is doing this entire drama for political reasons. Without following any protocol, he has come to Delhi and sat on a dharna. Moreover, he is already very famous for his U-turn on many issues. Whatever he says, the people of both the Telugu states will not believe him because he is famous for lying to people on several occasions. Naidu is a failure and people will give no response on this," BJP leader Ram Chander Rao told ANI.